When Kimberly Crepeaux, a known liar and drug addict confesses to her part in the murders of Jackie Pelletier and Ian Kelly two years before; Rob Barrett FBI investigator instinctively believes her. Barrett is an expert at getting to the truth and renowned for extracting confessions. This confession is recorded on a live video feed watched by other investigators. Barrett has “history” with one of them, Lieutenant Don Johansson of the Maine Police force. Barrett spent his summers with his abusive Grandfather in Port Hope and knows the people involved in this story. Right from the start, the reader is drawn into a puzzle. 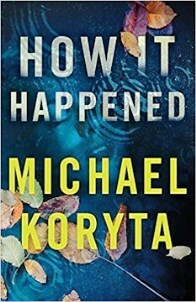 ‘How it happened,’ sits at the thematic core of this book, not only in the main plot thread but also with the characters in the sub plots. Barrett stakes his career on this two-year-old cold case. Kimberly says that Mathias Burke ran Jackie down with his truck and then hit Ian over the head. He then made Kimberley and her friend Cass Odom help him. Mathias forced Kimberley to stab Ian and help dump the bodies in a pond. The bodies are not in the pond where Kimberley insists they were dumped and Cass is dead from an overdose so cannot confirm the story. Mathias Burke is now a much respected local man who has built up a large landscaping and caretaking business. Barrett knew Burke when he was growing up in Port Hope; as he tries to get to the truth, memories from Barrett’s past come to the fore. Divers can't find the corpses, the evidence points to another suspect, Barrett is taken off the case and reassigned to Montana. Six months later, after having received repeated phone messages from Kimberley - Howard Pelletier pleads with Barrett to resume his investigation. Barret returns to Maine. An anonymous tip-off leads to the discovery of the bodies, 200 miles away, not stabbed but shot. Barrett is determined to save his reputation and find the truth of how it happened. He finds that a lethal heroin blend that caused the death of Cass three days after Jackie and Ian were murdered. Is Mathias connected the deaths, and how far will Barrett go in of his quest for the truth? To say any more about the novel would be something of a spoiler. The plot twists and turns, the characterisation is good, the atmosphere of small town America is well drawn. The characters are plausible and drive the novel towards a truly satisfying conclusion.